The storm clouds of the night before had long since blown away as we mingled around the van preparing for the day's ride. 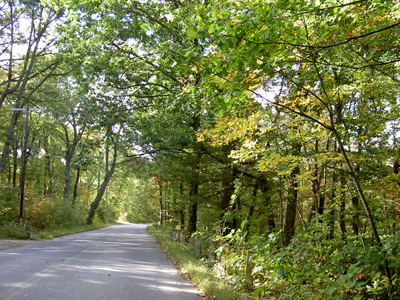 The temperature hovered around 60, which brought thoughts of a warm scenic fall ride. With bikes packed and tires inflated, the group coasted down the hill of our hotel to the bakery at the base for a morning's coffee and sticky bun. Need those carbs to fuel the body for a ride!! 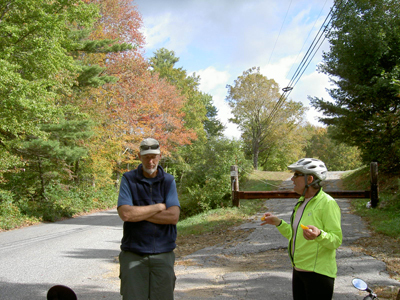 After satisfying our sweet tooth, the ride began slowly through the morning rush hour traffic of Sturbridge and out past the Sturbridge Village visited the day before. The slight breeze created while moving forward was a bit chilly, but within a half mile of departure any thought of being cold was dismissed immediately. There standing proud in front of us was one of the longest, steepest hills of the trip to date. It was unforgiving as it rose higher and higher above the town below. Every once in awhile the road would level for an instance to allow a breath to be caught, but not long enough to get the heart back to a natural rhythm. 12% grade to 13% grade to who know what % grade -- only that it was steep, long, paved, and fortunately for us not much traffic. Why were we glad there wasn't much traffic? When one is pedaling as hard as one can up a hill and the speed has decreased to about 3 miles an hour, the bike wants to swerve in and out in a slight traversing pattern to ease the pain of the push, pull of the legs. Traffic gets in the way of that sort of movement -- cars just don't understand!! But the hill was the only negative to the day. Once completed and the breath and heart rate were back to normal, the ride became a symphony of beauty. 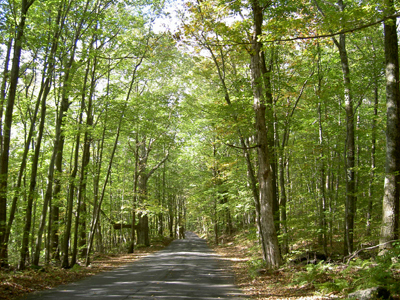 We entered a back country lane complete with trees arching over the roadway creating a cathedral effect. The colors of the ferns were now golden with a touch of brown. The oaks were shedding their acorns as well as some of their yellow and gold leaves. Each would gently float to the ground like a feather in air as the wind rustled through the trees. The maples are now red and yellow with still some green intermixed. The aspens have started their migration to yellow too. Each mile, each turn was more beautiful than the previous. 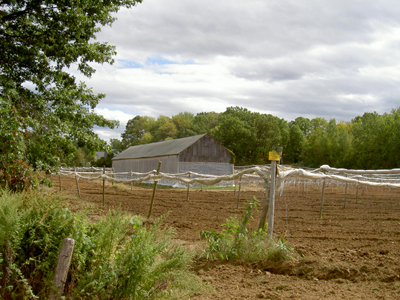 Even the farms that dotted the area were magnificent. 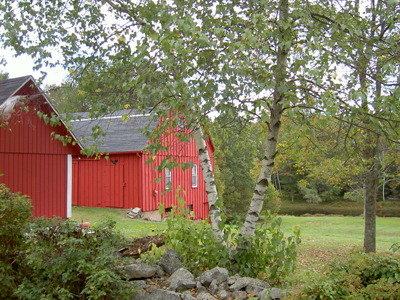 Barns of bright red surrounded by the green fir forests and the golden fields of fall jumped into view creating such an awesome sight. Old stone walls framed the roadway as they have for several hundred years. Early settlers had laid those rocks and it is against the law, thank goodness, to move them! We crossed into Connecticut very early into this beautiful ride. 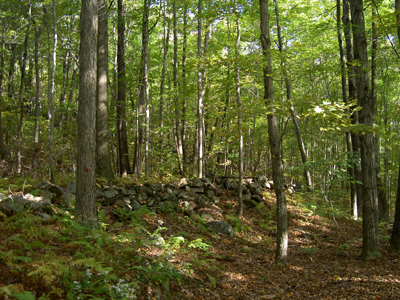 At one point the forest split open and the view of the Connecticut River Valley stood beckoning us to stop. For as far as the eye could see were Christmas tress, winter wheat, and tobacco. Yes, we learned that a major crop on this area is tobacco. For several hundred years the crop has been grown here and exported to either England or the Dominican Republic. Apparently this is the finest quality of tobacco grown in the US. We saw tobacco drying in a barn (with charcoal firepots every 10 feet to assure they dry); we saw tobacco hung in the field to dry wrapped in material to assure warmth. A local worker on the side of the road taught us all the finer things about tobacco growing. 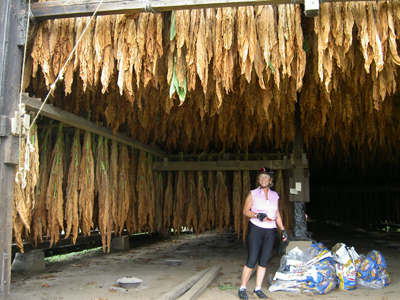 Seems the field wrapped tobacco is used as the outer layer on quality cigars and goes for about $50 a pound -- the barn dried is the "inners" of the cigar and only gets about $6 a pound. Very interesting! Never know what you can learn on a bike!!! The entire day was spent in this heaven. The route traversed the countryside pass lakes, streams and small villages, but always within the confines of beauty of nature. Now we are "camped" in a motel on the outskirts of the Hartford airport and must say goodbye to Lee tonight. She fly's home tomorrow with hopes of coming back in a couple of weeks or so. We will miss her, just like we have missing our other three friends who left before her. Midmorning Snack Time on the Road! 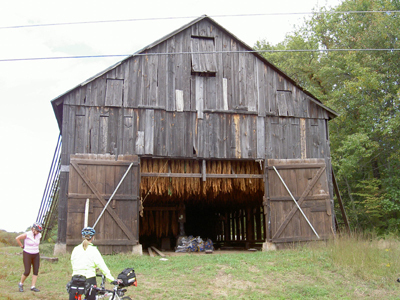 Tobacco Barn -- Cheap Stuff! Tobacco Drying in the Field -- Expensive Stuff!